Elite Stat: Hunt’s 104.8 elusive rating (measures a runner’s success beyond the point of being helped by his blockers) ranks second among all halfbacks. Hunt has now led this race for all five weeks to start the season, as he’s yet to have a single game grade yet below 80.0. He leads all halfbacks with a 91.2 rushing grade while his 83.7 receiving grade ranks fifth. The third-round pick out of Toledo has had nine runs this season of at least 15 yards, no other running back has more than five. 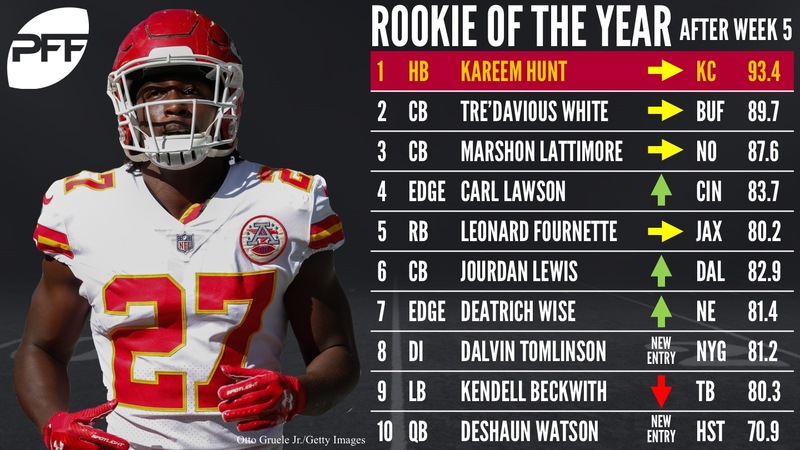 At this point, Hunt’s not just in the lead for rookie of the year, as of now he’s also one of the front-runners for both offensive player of the year and MVP. Elite Stat: Opposing quarterbacks have a 77.0 passer rating when targeting White in coverage, which ranks 34th out of 115 qualified cornerbacks. White was burned by A.J. Green for a 77-yard touchdown this past weekend, but apart from that one play he’s been exceptional through the first five weeks (outside of that one play he’s held opposing quarterbacks to just a 56.3 passer rating). White has been one of the very best this season at getting his hands on the football, he leads all corners with eight pass breakups and his 27.3 playmaker index (pass breakups + interceptions divided by the number of targets thrown his way) trails only Patrick Robinson. Elite Stat: Lattimore is being targeted just once every 10.3 coverage snaps so far this season, the 12th best rate among cornerbacks. Lattimore ranks seventh among cornerbacks with an 87.2 coverage grade this season while also contributing some solid play in run defense (75.6 run defense grade). Lattimore has finished two out of his three NFL games so far with overall grades of 87.0 or better, he’ll look to keep things rolling as the Saints come out of their Week 5 bye. Elite Stat: Lawson ranks third among all edge defenders with a 16.3 pass-rush productivity rating (PRP measures pressure created on a per-snap basis, weighted towards sacks). Lawson ranks seventh among edge defenders with his 85.7 pass-rushing grade and his 25 total pressures are tied with teammate Carlos Dunlap for the seventh most in the league among players at all positions. Lawson has tallied at least three pressures in every game of his NFL career thus far, with his season high being 10 (including three sacks) in Week 3 against the Green Bay Packers. Elite Stat: Fournette ranks fifth among halfbacks who’ve seen at least 15 targets with an average of 2.0 yards per route run. The fourth-overall pick in this years draft, it’s no surprise (especially given some of the quotes from head coach Doug Marrone this offseason) that Fournette leads the league with 109 carries and has been productive running the football, earning a 78.5 rushing grade that ranks 13th among halfbacks. What has been a bit surprising has been how effective he’s been as a pass-catcher; his 79.1 receiving grade ranks 11th among halfbacks and he’s dropped just one of 14 targets so far this season after he dropped seven of 49 targets over his final two seasons at LSU. Elite Stat: Lewis ranks 31st among all cornerbacks, surrendering an average of just 0.8 yards per coverage snap. With an 82.0 coverage grade and an 82.8 run defense grade, Lewis is one of just five cornerbacks to rank within the top-25 in terms of coverage grade while also ranking within the top-15 in run defense grade. Lewis ranks third among cornerbacks with a 25.0 playmaker index and he’s one of just four corners who have tallied more than five stops while not missing a tackle through the first five weeks. Elite Stat: Wise ranks 11th among edge defenders with a 13.6 PRP rating. Wise currently ranks 14th among edge defenders with an 83.0 pass-rushing grade, he notched two more (including a sack) on 26 pass-rush attempts this past weekend. The rookie out of Arkansas has been one of the very best in football at knocking the opposing quarterback onto his back, he’s one of just 12 edge rushers to have at least nine combined hits and sacks through the first five weeks. Elite Stat: Tomlinson ranks 10th among interior defenders with nine run stops (a stop constitutes a ‘win’ for the defense). After a short hiatus, Tomlinson is back within the top-10 after five weeks of this season-long race for PFFs rookie of the year. The Bama rookie has been on the field for 110 run-defense snaps this season – the ninth most among interior defenders – and he’s rewarded the Giants with an 84.0 run defense grade, 16th best among 122 qualified interior defenders. Tomlinson has now finished four of five games this season with a run-defense grade north of 80.0; combining his play with Damon Harrison, the Giants have one of the best defensive interiors in all of football in terms of defending the run. Elite Stat: Beckwith’s 12.6 run-stop percentage ranks seventh among all linebackers. After posting near-elite grades in each of his first two professional games, Beckwith is seeing his spot on this list split after back-to-back sub-par performances in Weeks 4 and 5. Despite his recent struggles though, Beckwith is one of 33 linebackers to be on the field for at least 100 snaps in run defense and 100 snaps in pass coverage. Among that group he’s one of six players to rank within the top-10 in both run-defense grade while also ranking within the top 15 in coverage grade, putting him in a group with Telvin Smith, Wesley Woodyard, Bobby Wagner, Ryan Shazier and Anthony Barr. Watson made his debut as an on the bubble player last week after a breakout game in Week 4 against the Tennessee Titans and he makes his debut within the top-10 this week after a strong follow-up performance against the Kansas City Chiefs on Sunday night. Watson still has plenty to improve upon as a passer if he wants to elevate his positioning within this race: His 60.1 passing grade ranks 31st out of 32 qualified quarterbacks currently (besting only fellow rookie, DeShone Kizer) and his 65.5 adjusted completion percentage ranks 31st as well. He’s made up for it so far though with some outstanding rushing – his 88.4 run grade leads all quarterbacks – along with his ability to produce with pressure in his face. Watson has made four starts so far, he graded below 70.0 in his first two while grading north of 78.0 (including an 86.9 game grade in Week 4) in the next two: If he continues to play like he has the last two weeks watch for him to shoot up this list.